One by one, Associated Press photographer Rodrigo Abd positioned the traditional dancers, musicians and vendors in front of an old-fashioned box camera in Peru’s Sinakara Valley as a colorful Andean festival exploded all around them. The men, women and children were among the tens of thousands of pilgrims representing some eight nations who came to this sacred place in Quispicanchis province in Peru's Cuzco region for the annual Snow Star Festival, shortly before this year’s Christian feast of Corpus Christi. After their portraits were made, the subjects spoke proudly of the ancient beliefs and rituals they keep alive in the 21st Century. “I’m proud to be another soldier for the Lord of Qoyllur Rit'i,” said 33-year-old Aldo Machaca Quispe, referring to the image of Jesus Christ venerated in the region. He sat for a portrait with his son Brandon, 6, and said he hoped to pass down his traditions to the boy. Last year, Abd, an Argentine native, used digital camera equipment to photograph the three-day festival that also coincides with the reappearance of the star cluster Pleiades in the Southern Hemisphere, signaling the abundance of the harvest season. But this year, he thought it would be interesting to bring his old-fashioned box camera, a primitive device built of wood and modeled on ones he first saw photographers using to take portraits in Afghanistan while on assignment there in 2006. With a lens and space for a developing lab inside, the box camera uses 19th-century technology to produce luminous, black and white images. Not only did he need to transport the heavy camera, but also its tripod, black cloths to make a photo studio, processing chemicals, along with his own tent, everyone’s coats, along with his own digital cameras through heights reaching some 4,500 meters and freezing temperatures falling as low as 39 degrees Fahrenheit (4 degrees Celsius). Abd’s camera and related equipment were brought to the valley on three of a group of pack horses carrying in supplies to the area set amid a snow-capped mountain range long adored by the Quechua people. Along with two assistants, Victor Zea and Ignacio Gonzalez Vigil, we set off on a 4-mile (8-kilometer) trek from the town of Mahuayani, Cusco, toward the plains where thousands of pilgrims camped out. 360 Video: Thousands of pilgrims gathered for the annual Snow Star festival in the Sinakara Valley at the base of the Qullqip'unqu mountain in the Andes. Inscribed on UNESCO'S Intangible Cultural Heritage list, the Peruvian festival features a pilgrimage by local people to the sanctuary where a boulder features an image of Jesus Christ known as the Lord of Qoyllur Rit'i (pronounced KOL-yer REE-chee), or Snow Star in the Quechua language. During the recent Andean festival, the people in colorful indigenous costumes, some wearing masks, others holding their Peruvian harps or other musical instruments, sit still for up to two minutes as Abd made exposures with light shining from the lens onto photo paper inside the box. Abd produced negative prints of each picture by passing the photo paper through developer and fixer sloshing inside the box. The negative prints were then hung with plastic clothespins to dry in the Andean air. With each one, the process was later repeated to make a positive print. The result was a series of stunning images of people from ancient tribes, in traditional garb little known in the modern world outside the Peruvian Andes. Video: Behind the scenes with AP photographer Rodrigo Abd as he used 19th-century photographic technology to make portraits of traditional dancers, musicians and vendors on the edges of a popular Andean festival in Peru’s Sinakara Valley. 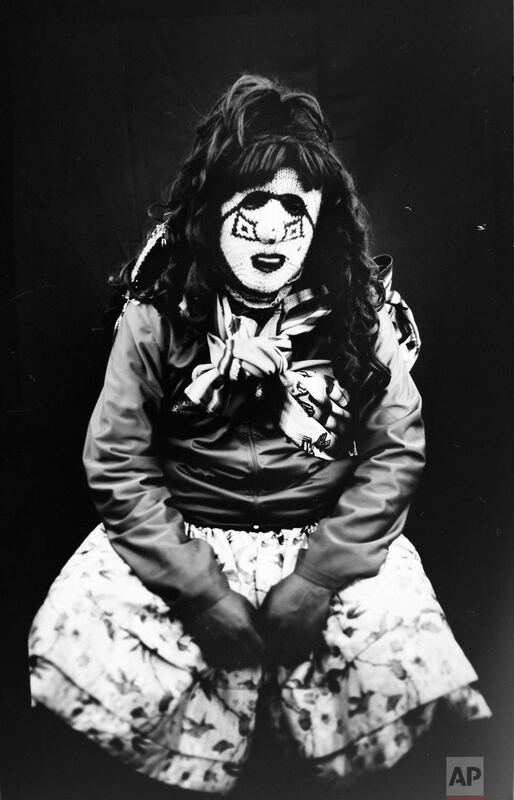 Text from the AP news story, AP photographer uses box camera for Peru festival portraits.